In 2006 Dave Bunting led a team of elite climbers on a groundbreaking expedition aiming to become the first British team to climb the formidable and rarely attempted West Ridge of Mount Everest. Dave conceived, planned and led the expedition as well as being a strong member of the climbing team himself. This highly publicized expedition earned Dave an MBE, presented by the Queen, for his outstanding leadership and was filmed for a televised documentary Everest: Man v. Mountain. He has since contributed to and edited a book; Mountaineering: Training and Preparation, published by Human Kinetics. His inspirational presentation of his experiences planning and leading the expedition on Everest’s spectacular West Ridge, is a riveting and awe-inspiring account of the leadership skills and determination necessary to select the right team, motivate and engage them and build a shared vision that will enable them to reach their goal. After an incredible 8 week team effort on this outstanding route the summit team had to turn back only hours from the top due to extreme avalanche conditions. This extraordinary situation allows Dave to paint a picture of outstanding teamwork, tough decision-making, personal challenge and enduring friendship in the most extreme environments. With stunning images from the rare vantage point of the West Ridge of Mount Everest, it is a presentation that will inspire, move, entertain and leave a lasting impression. Dave is a leading specialist with over 30 years of experience in the mountains. His expertise was developed serving in the Army's Physical Training Corps leading people within the British Services, including extensive work with elite units such as the Special Air Service (SAS). With 13 Himalayan expeditions to some of the world’s highest peaks under his belt, he continues to organise and lead regular expeditions. He also uses his experience to deliver experiential leadership and team development programmes to a variety of clients ranging from universities to blue chip companies. Dave has been on the speakers’ circuit for 8 years and has presented regularly to a wide variety of audiences from small groups up to 1600+ theatres including presentations to a number of major companies. 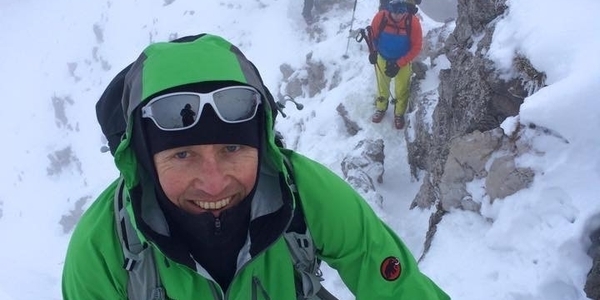 He has delivered to high level senior managers, consultant surgeons, national sports teams and fellow mountaineers and at each and every venue Dave remains relevant and engaging.